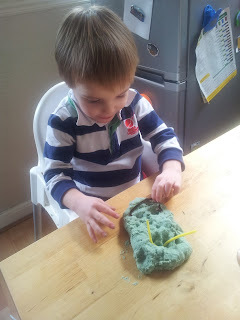 Not Even a Bag of Sugar: Cubby Kit - Great Fun on a Rainy Day or a Sunny One! Cubby Kit - Great Fun on a Rainy Day or a Sunny One! You will no doubt have noticed the cute little advertsiement in my sidebar for Cubby Kits, and I wanted to tell you more about them. We recently received one of the kits for Joseph to play with, and for me to review. Joseph was in one of his moods where he was tired but not sleepy so I suggested we get out the Cubby Kit. "Mummy, what's a Cubby Kit?" he asked, and what a good question! There are 2 cubby kits available, one for 3-4 years olds which we tested, and the other for 5-6 year olds. The kit comes addressed to the child in a lovely sturdy box and contains all the supplies you need for 3 activities. Our box was all about outer space. We did two of the activities, making martians and a lovely picture of the constellations. We have the rocket ship to make another day. The beauty of the kits is that they contain everything you need for the projects, down to the glue. There are also some extra bits included. The instructions are very clear. I have to say, since I have had the advertisement many of you have asked if the price is good value. I think it is and here is why. How many of us would love to do craft but are stumped for ideas? Each month is themed and you get three projects which are well tested, and have an educational base. How many of us have the storage space for loads of different craft items? This way you have exactly what you need, no frustrating trips to craft stores for the right glitter or that glue you forgot you would need. If you subscibe at £19.99 per month you can cancel at any time. Alternatively you can purchase a years subscription for £199.99, effectively getting 2 months free of charge. Joseph really enjoyed making martians, and burying the eyes in the dough! The homemade dough is pretty much the recipe I use and works every time. It was great having everything, the salt, cream of tartar, flour, oil and colouring pre measured and I just had to cook it. 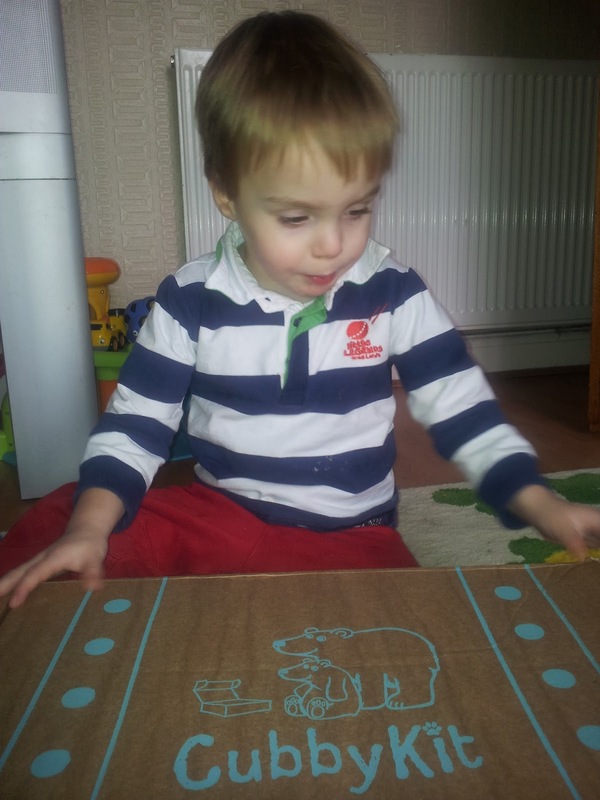 The picture was lovely fun and Joseph's first experience of sticking pictures with pva glue, certainly at home. We had an enjoyable couple of hours, and still have a project left!